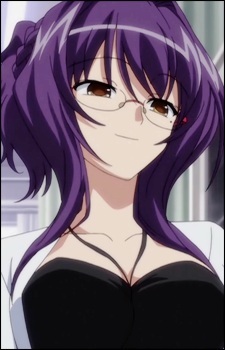 Saiko Akamine is the nurse of the school that Kakeru and Yuka attend. Saiko reveals in episode 5 that she is the legal guardian of Tajima Takahisa after their first meeting when he was young. At the time she took him in, Saiko was a young Motorbike enthusiast involved with a gang. Saiko says that when she saw Takahisa in his deprived state, she thought that she was the only one who could look after this child. Although Takahisa doesn't treat Saiko as his mother and vice-versa, they do care for each other, as shown by their harmless banter and how Takahisa brings Saiko cigarettes whenever he visits. During episode 9, Takahisa and Yukiko are walking to the Nurse's office to get Saiko so they can get something to eat. However, when they enter the room, they find Saiko tied upside down, dead, with Superbia sitting next to her. This causes Takahisa to go on a rampage. Takahisa then tells Yukiko that without Saiko, he couldn't stay sane and that his parents had abandoned him because of his power but Saiko took him in knowingly. At the end of episode 12, Kakeru, Yuka, Kaori, and Tadashi are shown on the roof of the school. Kakeru narrates that he and Yuka don't talk about the Red Night anymore. Yukiko and Takahisa are revealed to be alive and dating in this world, and they apparently don't know Kakeru or Yuka anymore. Saiko is also shown to be alive as she chases Takahisa for stealing money.